Agility is important to me. For me, agility and innovation have needed to always go together. I named my company Agility Innovation Specialists and at its core, we state that the value of this focus can offer a real “intensity in innovation” that we believe reflects today’s world of need. We encourage you to disrupt the accepted, to constantly challenge the current ways and push into uncomfortable territory. We suggest you seek out customer’s unmet needs, unexplored opportunities to give a new diversity to any thinking, and then we set about accelerating these ideas to fruition. Those all need abundant and constant agility. Many of our business organizations continue to struggle with innovation and how to make it repeatable, sustaining and transformational. Often, it seems, the more large organizations attempt to become ‘agile’ the more they seem to achieve the very opposite, of rigidity. Finding solutions to building agility is part of the necessary answer to achieving greater innovation solutions. I have been reading a good academic paper recently, one that I came across in my Big Data and Cloud research I have been undertaking. The paper is called “Collective Agility, Paradox and Organisational Improvisation” by Yingqin Zheng, Will Venters and Tony Cornford, found on the London School of Economics site, under the department of Management. Their point gained from studying GridPP and its part in the Large Hadron Collider Computing Grid (LHC) where they observed a collective, agile and distributed performance rather than seeing ‘agility’ as small-group and deliberate systems development practices often associated with ‘agile’. It got me curious. Here is my summary of their paper. It certainly offers some pointers to managing in more agile ways in complex and often disparate organization. 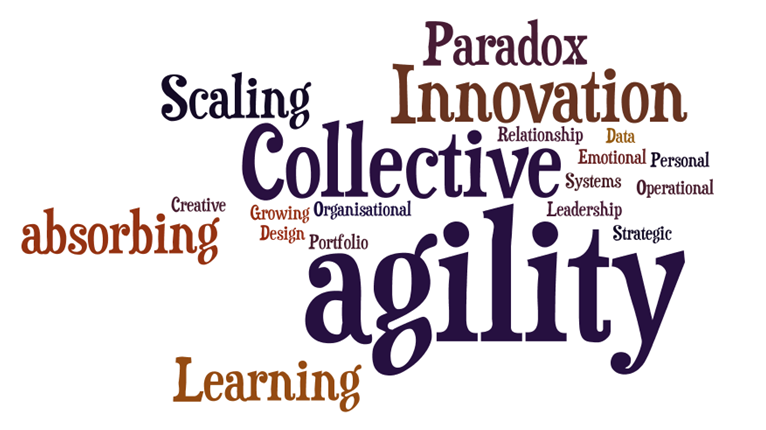 Collective agility is focused on the same objective: shared. In terms of business, it means the mission is shared by all and this mobilizes each person in ways that I feel are tying agility to innovation in new ways, well for me anyway. It is providing an environment where “unintended consequences” emerge, many positive, others less so, where random thoughts and ideas collide and through these exchanges within the community they form a “collective mindfulness” to solve these complex challenges. Collective agility seems to require loose coupling, not heavy structures or rules, encouraging a culture of improvisation and constant ‘tinkering’ that comes from not just intelligence, trust and pragmatism but by the knowledge that lies within the community. Collective agility needs to have minimal structure, flexible planning, extensive communication and social bonding, all working towards this coherent, facilitated and growing feeling of making good sense (sense-making) through this coordinated but distributed network. Collective agility is about accepting what is unpredictable and uncontrollable yet working within given boundaries, actively working upon seeking out an improving performance and capability, to still perform in this circumstances of uncertainty. Now for me, many organizations are grappling with uncertainty, volatility and unpredictable situations and resort to trying to master them in rigorous, highly disciplined ways. This ‘collective agility’ is suggesting we go the other way, we let go, hang loose but stay collectively focused by just reacting in agile ways. Does that raise some different thinking for you, it does for me. We are seeking out improved performance but in really agile ways across a distributed community or network. Large organizations today are regretfully still tackling thorny problems in ‘given silo’s’ and this ‘collective agility’ thinking might open up our ideas about collaborating and co-creating in different ways. It is in the combining of performances, that tackle issues in improvised ways but within a trusted and pragmatic way. It creative productive tensions, dynamics and motivating challenges and the group feel that ‘capacity for action’, motivated to combine, share and explore together to solve the problem. Rules, structures and organized events often inhibit and feel contrived, the idea behind ‘collective agility’ is it is more natural even within organization with established routines and strong cultures as they can bind, provide collective strength, as well as inhibit. It is seeking out the minimal structures, releasing the flexibility and bonding that can come from these routines and stronger cultures. According to the authors, agility can be learnt through ‘learned improvisation’ where some established tools are dropped or removed and some ‘surprise, risk and wonder’ are allowed into the exchanges. The atmosphere of experimentation, trust, shared goals and emotional bonds provide for confidence to grow, in sharing and learning from made mistakes, as it contributes to the ‘higher’ cause of what the community is tackling within these tough problems. The group grows in its ‘sense of pride’ in working and searching for a higher cause and even willing to undertake unpopular tasks to move exchanges along. The motivation grows by this ‘collective agility’. The final thought is agility requires a mental attitude “to let go of control” to interact, to improvise but to seek to keep that sense of cohesiveness of constantly wanting to work things out, working consciously to keep moving forward towards the higher task. The authors suggest science becomes more like an art- visionary, experiential, passionate, agile and emergent. I’ve written about art and science before, see here “Renaissance comes from combining art and science for innovation“, so I can relate to this need to bring these two often separate practices into one again. 1) The paradoxes of learning: “as we struggle between the comfort of the past and the uncertainty of the future which are fundamental to the process of innovation, transformation and sense making”. Learned improvisation and reflective spontaneity. 2) The paradoxes of organising: “reflecting tensions between control and flexibility, formal and informal, integrated and differentiation denoting an ongoing process of striving for equilibrium of often opposing forces”. Planned agility and structured chaos. 3) The paradoxes of belonging: “we strive for both self-expression and collective affiliation”…but also being “self-driven, intelligent and creative people, yet they also have an acute appreciation that success relies on collaborative effort”. Collective individuality and anxious confidence. They finish within the paper offering a useful tables highlighting some key organizational practices that help to make this collective agility work through these paradoxes. Agility is linked to change. Change is constantly throwing obstacles in our way. We are urged to be nimble, to react quickly, and to tackle challenges in new ways. Developing agility allows us to be in a constant ‘state’ of recognizing nothing is seemingly staying the same. Gaining that critical sense of collective identity missing from many in our organizations. By knowing “we” are collectively all working towards the same purpose, constantly having the progress mutually reinforced, allowing for clear debate but being pushed and moving forward, being allowed to freely exchange within a common purpose in ‘collective’ ways, then we are certainly are moving towards a more fluid, organizational agility. This ‘collective agility’ might alter the ways we can tackle tough problems and work in volatile environments, that then can yield in collaborative ways, solutions that are more radical and breakthrough in innovation, something we should all be striving to achieve. Certainly this does offer some interesting thoughts to take collaboration and co-creation further through this collective agility concept of greater improvising. This entry was posted in Polymers and tagged absorbing and adapting for innovation, absorptive capacity, agility and innovation, co-creation, collective agility, combining art and science for innovation, complexity within innovation, increasing agility, innovation and learning, open innovation and collaborations, Reduced complexity from innovation, The Power of Global Collaborative Innovation. Bookmark the permalink. ← The growing need is to move innovation into the cloud.